This is how the organisms, which lived in the sea at the end of the the Vendian period, looked like. It all happened about 600 million years ago during the last geological period of the Neoproterozoic Era. Some of these organisms were floating in the water, while others were crawling along the bottom or leading sessile benthic life. The ancestor of bilaterally symmetrical animals looked this way and had tentacles. Credit: Picture from the exposure of The Y. A. Orlov Museum of Paleontology. 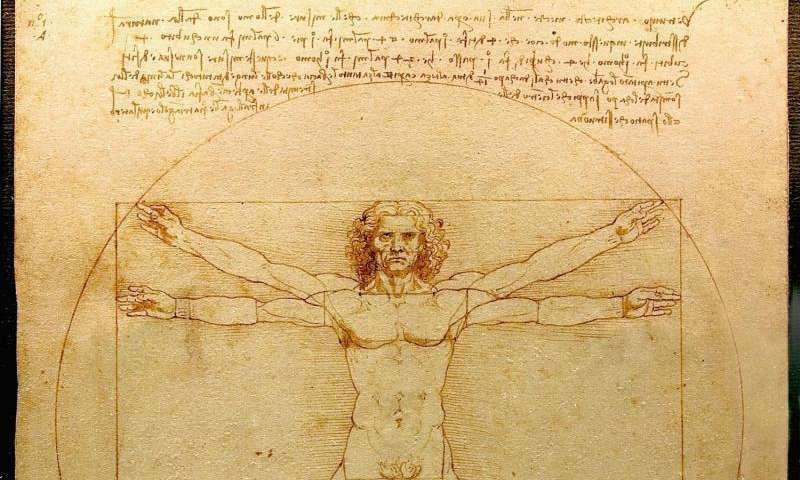 The famous Vitruvian Man drawn by Leonardo da Vinci pictures the canon of human proportions. However, humans didn't become bilaterally symmetric suddenly. There are two main points of view on the last common bilaterian ancestor, its appearance and the course of evolution. It is likely that the ancestor of Bilateria appeared at the end of the Vendian period, the last geological period of the Neoproterozoic era preceding the Cambrian period. It lasted from approximately 635 to 541±1 million years ago. The organisms, which lived in the Vendian sea, had mostly radially symmetrical creatures. Some of them were floating in the water, while others were crawling along the bottom or leading sessile benthic life. There first point of view on the last common bilaterian ancestor suggests that it was a worm without a coelom, the second body cavity. Proponents of this theory are sure that in addition to the lack of the coelom, the last common bilaterian ancestor was devoid of any appendages and had simple nervous system. According to the first view, the coelom appeared independently in different groups of bilaterally symmetrical animals. 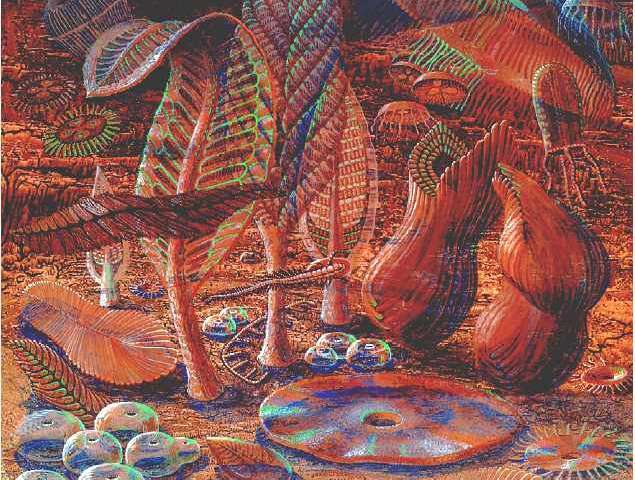 The second point of view, that of the Russian zoological school, suggests that the last common bilaterian ancestor was a complicated coelomic creature and had appendages for movement and food collection and a complex nervous system. According to this view, the coelom in different groups underwent reduction for various reasons related to the peculiarities of development, anatomy, and lifestyle. The hypothesis was originally created by the British zoologist Adam Sedgwick (Quarterly Journal of Microscopical Science, 1884, 24, 43-82). He proposed that the last common bilaterian ancestor descended from a common coelenterates ancestor, which had radial symmetry and multiple chambers in the gastric cavity related to formation of the coelom. This idea was later developed in the works of professor Vladimir Malakhov, the head of the Department of Invertebrate Zoology at the Faculty of Biology of the Lomonosov Moscow State University and the corresponding member of the Russian Academy of Sciences. (Journal of Common Biology, 2004, Nature, 2004). 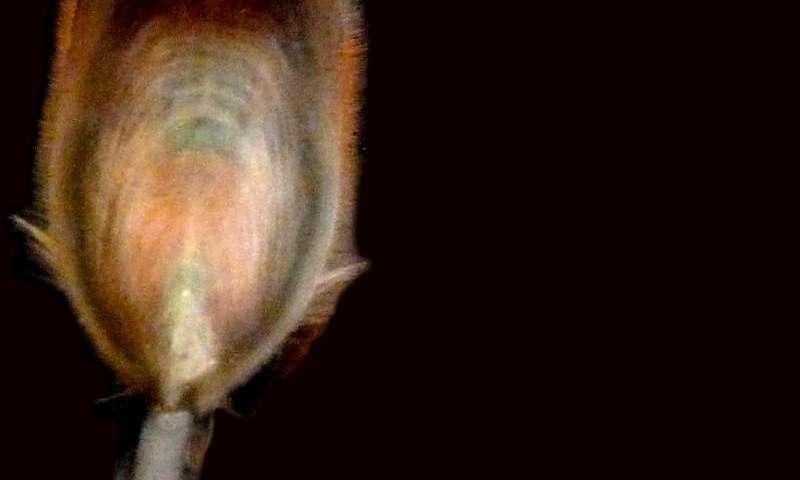 Professor Elena Temereva, the leading researcher at the of the Department of Invertebrate Zoology at the Faculty of Biology of the Lomonosov Moscow State University, succeeded in finding new evidence supporting the second point of view. Moreover, she was the lead author of a research paper co-authored by Eugeni Tsitrin from the Koltzov Institute of Developmental Biology of the Russian Academy of Sciences. The article will be published in PLOS ONE. She made her findings during studies of Lingula anatina, which is a representative of inarticulate brachiopods. Lingula is one of the oldest brachiopods having survived survived to the present day. It is known from the Early Ordovician, about 500 million years ago. The fossils of Lingula are found all over the world. Most of the were found in Europe, Southeast Asian and North America. "Our study shows that there is a group of the Lophophore animals among the Bilateria—Lophotrochozoa taxon, which includes the largest variety of types of animals,—Elena Temereva says,—The lophophore is a special organ that carries tentacles. Phoronids, brachiopods and bryozoans (ectoprocts) have collectively been called lophophorate, because they have the lophophore. However, multiple molecular phylogenetics data shows that there is no united group of the Lophophore animals." Lingula is one of the oldest brachiopods having survived to the present day. It is considered by biologists to be a living fossil what means the organism which has remained unchanged over the past millions of years. Credit: Elena Temereva. Elena Temereva said that she has managed to prove otherwise through research conducted by immunocytochemistry techniques, laser confocal microscopy, 3D-reconstruction and transmission electron microscopy. It means that the group of the Lophophore animals does exist and that it descended from a common ancestor, which had both the lophophore and the tentacles. It was confirmed by the similar structure of the nervous system of the lophophore in different groups of the Lophophore animals. It was first shown in the works of Elena Temereva. "By virtue of the fact that there are tentacles among the two main taxons of bilaterally symmetrical animals, it is logical to assume that the common ancestor also had them. It means that the common ancestor of chordate animals, including people, also had tentacles," Temereva explains. Therefore, the common ancestor of bilaterally symmetrical animals had tentacular appendages, which is consistent with the ideas of the Russian zoological school. Elena Temereva is sure that the results of this work will help to construct a natural system of the animal kingdom, through which the classification of species will become more specific. "However, multiple molecular phylogenetics data shows that there is no united group of the Lophophore animals." The period of time before Cambrian is now known as Ediacaran, not Vendian any more. So what came first, the non-skeletal arm that's great in tension but has almost no compression strength or the addition of a skeleton to that tentacle arm that gives it both tension and compression strength? Gee, I guess I answered my own question and also why an octopus can't shoot a bow. Boy howdy that outta piss off the god squad.